I’ll need to borrow some photos from the interwebs for this post because this was some truly spontaneous birding and no camera was present. A few weekends ago, Beth, Julian, and I were out and about running errands. After our errands were done, I realized that we were not too far away from the NJ Meadowlands where Barn Owls and Short-eared Owls had been seen recently. Ok, so we were about 30 minutes away… but did I mention there were owls? My super flexible wife was more than accommodating. 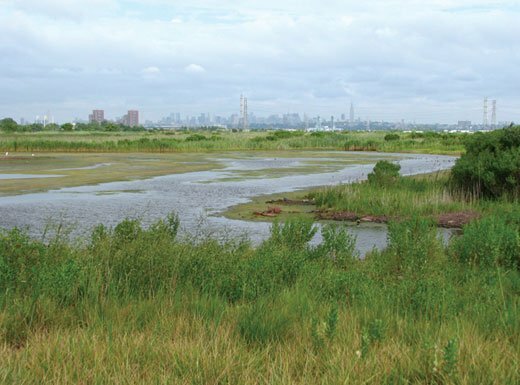 For those not aware, the NJ Meadowlands is 8,400 acres of wetlands in northeastern NJ fed by the Hackensack River. It is virtually surrounded by urban sprawl. The NJ Turnpike flows right through it, New York City is within earshot, and Giants Stadium is built on top of it. It’s an oasis and a mecca of birdlife that has mostly survived despite plenty of human encroachment. Winter birding is especially good for raptors like Rough-legged Hawk, Northern Harrier, and American Kestrel. Barn Owls enjoy the landfills that are part of the area and Short-eared Owls take advantage of the open space. Snowy Owls are seen on occasion too. We arrived at DeKorte State Park, one of the many access points to the Meadowlands, close to dusk. I ran into a friend who knows the area well and he escorted me to the fields where the birds had been seen. So we did what owl watchers do when you arrive before dusk… we waited. NOTE: Only bird in public areas in the Meadowlands. Valley Brook Avenue in the Meadowlands is in the middle of a remediation site and can be a very dangerous place for pedestrians. Also, there is no parking allowed on Valley Brook Ave. Cars could be ticketed or towed. Many of the access points along this road have restricted access and you may be stopped by police. As we waited, a few other birders arrived. Two Northern Harriers coursed over the fields, periodically dropping into the grass in an unsuccessful grab for prey. We waited for the changing of the guard – the shift from the day hunting Harriers to the night hunting owls. A Red-tailed Hawk and a Cooper’s Hawk made an appearance. It started to get dark. No Harriers anymore… and no owls. Fifteen minutes passed. Twenty minutes passed. Two of the other 4 birders who had joined our vigil began to make their exit. As they were exiting, I spied an owl about 100 yards away dipping and diving into the grass. “Shortie!” I called out. We all enjoyed brief views of a Short-eared Owl before it disappeared behind a berm. Just then, another owl seemed to materialize out of thin air about 20 yards down the path we were standing on. It was flying right towards two other birders who were looking essentially in the other direction. 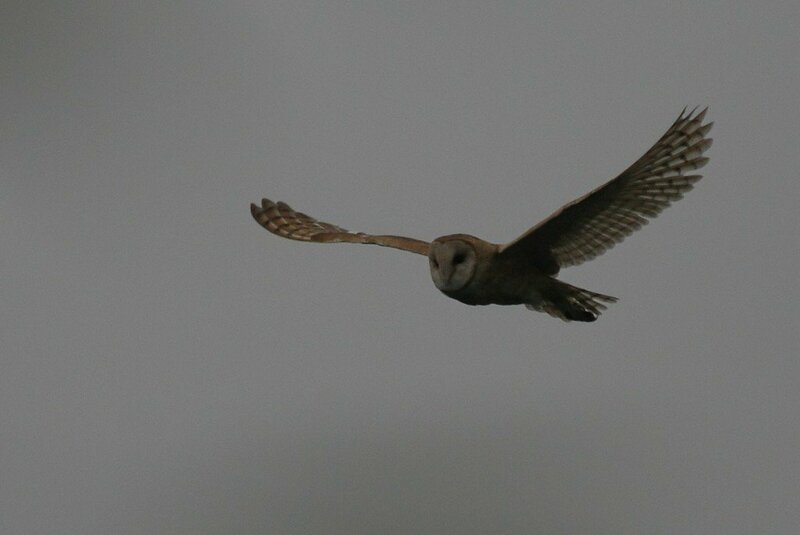 The ghostly white face of the Barn Owl was unmistakable. It’s moth-like flight captivated us as it floated a foot over the other birders’ heads, right in front of us, and then disappeared as quickly as it appeared. We waited another 10 minutes or so to see if any other owls would appear, but they did not. Even a brief appearance by an owl is a memorable one. As an aside, also recently seen in the DeKorte/Valley Brook/Disposal Road area… Red-shouldered hawks. They’re not a frequent visitor! Ah the ghost owl strikes again. I remember my first trip down the hill from my house, heading into town for a Christmas Bird Count. A Barn Owl suddenly appeared right in front of my car and I had to literally slam on my brakes to miss hitting the ghostly figure. And then it was gone. I took this as a good omen for the bird count and it turned out to be one of the most satisfying days I recall birding. My first Christmas Bird Count. I learned a lot about birds that day! Congrats on finding both a Barn Owl and Short-eared Owl. I ought to look for those up there sometime.